Partner Sites to Check Out! The Maryland SPCA’s mission is to improve the lives of pets and people in the community. We are dedicated to helping both pets and people and to saving the lives of animals in the community. Our newly-built adoption center adopts out more than 3,500 needy and unwanted pets each year. Their Spay and Neuter Clinic performs approximately 9,000 surgeries each year, making the Maryland SPCA the state leader in providing this crucial lifesaving service. Other lifesaving programs include a foster program, Wellness Clinic, and Training classes offered to help keep pets in homes and out of shelters. ​Teachers for Tails was created by Lori Raxenberg, now on the Board of ReLove Animals and in a leadership role with Education for Responsibility project. 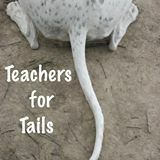 Teachers for Tails is an organization designed by educators to help Baltimore’s homeless animals. Our mission is to educate City Schools kids and families in proper animal care and to build empathy for those in need. In partnership with BARCS (Baltimore Animal Rescue and Care Shelter), Teachers for Tails will also fundraise for money and supplies and volunteer time to directly impact the over 11,000 unwanted, abused, and stray animals that enter the doors of BARCS each year.